I know, I know, I’m late to the party… again. First it was the spaghetti squash party. Then the mug cake party (that was a good one). Now it’s the overnight oats party. And even though I have been meaning to try making them for ages, I just never got around to it. But last night, I felt inspired. Well, actually, I was supposed to be studying for midterms so I felt like procrastinating. The result of my procrastination was these deliciously simple raspberry chia overnight oats. I LOVE recipes that are healthy and (a) can be made in advance, (b) can be made with pantry staples that are always on hand, or (c) can be whipped up in a short period of time. These raspberry chia overnight oats tick all three boxes. You make them the night before so the chia seeds and oats have time to soak up the liquid. All of the ingredients are staples in our house, and have the potential to be staples in yours too, if they are not already. 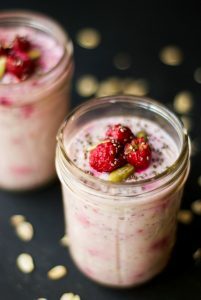 You will need oats, chia seeds, vanilla extract, yogurt, milk, honey, and frozen raspberries. All of these ingredients can be stored for quite a while in your pantry, fridge, or freezer. And as for the prep time, it takes about 10 minutes to assemble these little beauties. Not only are these overnight oats full of protein, fiber, and omega-3s, they also make the perfect grab-n-go breakfast for busy mornings. And the fact that they are served in mason jars makes my morning just a little bit brighter. **You can substitute regular non fat plain yogurt, it just doesn't contain as much protein. Mix all the ingredients in a large bowl. Mix well to make sure the honey gets dispersed and doesn't sit in one lump somewhere in the mixture. Pour the mixture into mason jars or some other small vessel with a lid (for example, a leftover jam jar). Put in the fridge overnight (or for at least a couple of hours). Yum! I love overnight oats.. they make my mornings so much easier! I know – I love being able to just reach into my fridge and there’s my breakfast, ready and waiting. This is a fabulous way to enjoy chia – I love the pretty presentation! They are definitely worth a try. So quick and easy. I looove overnight oats, and now I’ve got my partner hooked on them as well! They’re so easy to make and makes morning prep almost zero. Also, soaking them overnight also makes them more digestible, which is always a plus! I actually just made a chocolate version for tomorrow, next time I’ll try this raspberry one! Overnight oats are my favorite! Going to have to try this version. Thanks for sharing on healthy living link party! Hi Esther, do you think you could make these overnight oats with Steel Cut Oats? Hi Kyle. I have never done it myself, but I don’t see why not. I imagine they would be somewhat more chewy and dense than with regular rolled oats, but probably still very tasty. If you try it I would love to hear how it turns out. Thanks for the quick response! I tried the peanut butter version last night, and ate it for breakfast this morning! It was delicious! A couple of changes I made: I cooked the steel cut oats the night before. I used unsweetened coconut milk vs almond milk, as I had it on hand. The steel cut oats actually softened up overnight. I also like the added density of it, I was full after half the amount of oatmeal I would usually eat. That sounds delicious Kyle. Thanks for your feedback. I’m going to give it a try with steel cut oats. Sounds yummy. I do sometimes have a problem staying full after breakfast, so maybe steel cut is the way to go. You’re welcome. I really enjoy your site, my wife and I also tried the apple pie pancakes for breakfast last weekend and thought they were great. I look forward to trying more of your recipes soon. Quick and delicious recipe – love the creamy texture! Just prepped it for a tasty treat after a run tomorrow morning 🙂 Thank you!